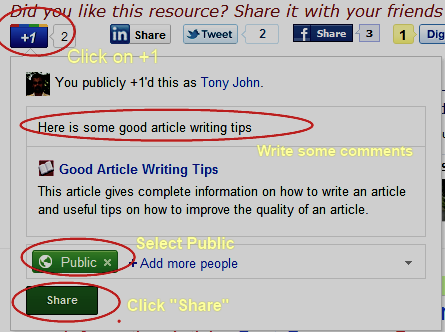 In this post, you can learn how to publicly share a Page from this in your Google+ Profile. 1. Go to Social Settings Page and make sure you have entered your Google+ Profile Id in the corresponding field. 2. Go to the Resources secton and view any resource that you like to share. 3. Go to the bottom of the resource and locate the +1 Button. 4. Click on the +1 button and wait for a small popup to appear that says "You publicly +1'ed this as [your name]. Share what's new". 5. Click on it and type an optional comment. 6. In the field where it shows + Add more people, make sure you have selected "Public"
How to share a page that does not have a +1 sharing button? In order to verify you are the owner of the Google+ Profile you specified in your Social Settings page, you should publicly share your profile page from this site to your Google+ profile and should not delete the sharing.